Ever pass a Chinese herbal medicine shop and wonder what all those bizarre ingredients are? Well, wonder no more. Leon Letoto of Hawaii Healing Garden Festival recently took us on a Chinatown tour to help demystify them. And there is perhaps no better teacher of Chinese medicine and cultural arts than Letoto, a knowledgeable and personable expert in his field. Letoto has practiced oriental medicine for 34 years. He is a licensed acupuncturist and has a bachelor’s degree in Asian studies from the University of Hawaii and master’s from Tai Hsuan Foundation College. Letoto is a mixed plate of ethnicities: Hawaiian, Chinese, Marshallese and Japanese. He has always been fascinated with Asian culture. Raised in Waipahu, his parents and grandparents brought him to the markets in Chinatown as a youth and taught him to select the best and freshest ingredients for family meals. He recently led a Chinatown herb shops tour as part of the annual Hawaii Healing Garden Festival that celebrates multi-cultural healing arts on four islands from June through November. A highlight of the Oahu festival was his Chinatown walking tour and Chinese medicinal cooking class. The articulate tour guide is one of the festival’s most popular presenters, providing fascinating facts and insights into Chinese healing arts and dietary therapies. Ask him where to buy the best live abalone, a great place to find exotic teas and where the sweetest watercress can be found, and he’ll direct you there in a flash. His anecdotal descriptions of Chinese mercantilism are as much fun as his informal narrative tour of Chinatown’s established herbal shops. I’ve always avoided these mysterious merchants, thinking they were fronts for an opium den - or worse, a pool hall. I expect to see McGarrett and Danno in a showdown with diabolic Wo Fat in those dark, narrow alleys of Chinatown. But a little enlightenment counters fear. There are about 15 herb shops in Chinatown, dotted along Maunakea and Smith streets. There seems to be one for every two noodle shops. There’s no yellow pages listing for Chinese herbalists; you simply have to walk the streets and encounter them by signs - modest, hand-painted ones, not neon displays like those brazen Western pharmacies. We start at the Chinese Cultural Center on Beretania Street, where Letoto points out Tak Wah Tong Chinese herb shop across from the Moon Gate stage. This is the only shopkeeper, he indicates, who has an ancestor who prescribed herbs to the Emperor of China in the Ching Dynasty, more than 100 years ago. Scrolls and proclamations hung on the wall indicate a generational hierarchy of high standing in martial arts and medicinal practice. The Tak Lau family migrated from Canton in 1980 to seek their fortune selling ancient remedies. They offer more than 700 herbal cures for everything from asthma to impotence, even the common cold. Like most herb shops, the minute one steps into the room, there is a strong earthy aroma. It’s as if one has entered a forest of dehydrated trees, bark, weeds, and petrified animals and insects. That’s not far from the truth. Letoto tells us that for many centuries China had no refrigeration and ingredients were dried for preservation. you are stored. For the newcomer this can be intimidating, as the labels are all in Chinese and there are no familiar brand names. There’s not a Bayer or Vicks among them. Clara Wong, doctor of acupuncture, tells us at her shop on Smith Street that there are many categories of herbal medicine, and each vendor has a unique system. There are about 5,000 different species of herbs in existence, and of these about 2,000 are used as medicines. Some are more frequently prescribed than others, and a typical dispensary will stock about 500 herbs. A visit to an herbalist begins with a consultation about one’s health, including eating and sleeping patterns, followed by the taking of one’s pulse and examining one’s tongue. 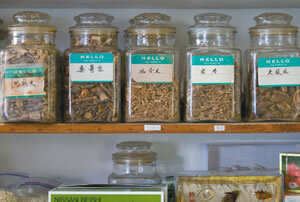 The herbal aspect, according to Dr. Wong, accounts for only half the scope of Chinese medicine. Chinese medicine treats the body as a whole, only occasionally targeting a disease - a distinct contrast to Western medicine. Chinese herbs are rarely taken as a single dose. In a typical transaction, there will be several items packaged for a take-home mix that one boils to a soup or tea. A slight cold takes at least seven herbs; a serious flu might take 24. The prescription might consist of buds, twigs, seaweed, tree bark, roots and seeds. More exotic products sold in this trade include sea cucumbers, seahorses, lizards, deer musk glands, shark fins, antlers and crocodile bile. A boiled-down concoction is digested so the natural ingredients can do their work in your bloodstream. Sort of the chicken-soup theory of wellness. Yin-yang is simply a symbolic way of defining opposite forces that are at work in everything. So if you have a cold, a bowl of hot soup - chicken or herbal - should help. Chinese believe food and herbal medicines correct yinyang imbalances. That led us to the kitchen, where Letoto prepared dishes with local and seasonal foods and herbs. One’s diet should adjust according to the seasons, he explains. In summer, cooling yin foods should be served, and in winter, more warming yang foods should be added. Following is a Letoto summer recipe using mushrooms, which have healing properties. They are an excellent source of protein and vitamins with particular effect as immune system-boosters and anti-tumor factors. For exotic recipes including herbs such as dang gui (Chinese angelica root) and jellyfish, check out the Hawaii Health Guide web site. 1) Add 1 tablespoon of oil to preheated pan. Add 1 teaspoon of minced garlic and the mushrooms into the pan. Toss ingredients to lightly coat mushrooms with oil. Add soy sauce and pepper. As mushrooms sweat, add salt and sesame oil to taste. Remove the mushrooms and repeat the process until mushrooms, black fungus and pea sprouts are finished. You need not add soy to the pea sprouts. 2) Mix all ingredients together and decorate with parsley. Hawaii Healing Garden Festival continues on Maui Sept. 27-30 and the Big Island Nov. 1-2. For information and registration, contact Hawaii Health Guide at 638-0888 or www.hawaiihealthguide.com.